Mr. Brown brilliantly interprets classic marquetry patterns in a lively patchwork of positive and negative space. 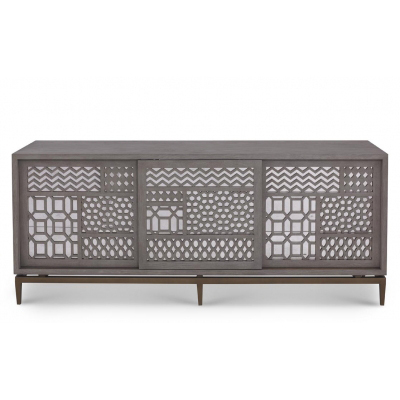 The fretwork carving is backed with aged mirror for concealed storage. The cabinet is set on a simple Aged Brass frame. Cut-out panels in the back make cord management easy. Available with or without aged mirror behind the fretwork carving for concealed storage.